There are two kinds of books with cliffhangers. The first kind are the ones which makes you smash them because it feels like you were played and been dragged on along the way until the end, and was left with a heart attack. There are the kind of books you cursed upon and made you twit the author just how you are frustrated with the ending. And there are the other kind, which they also left you hanging but made you smile because they brought you along with a good journey. These are books that made you go to the author's website or on goodreads just to click the next one for future book release. This book is definitely belong on the latter kind. 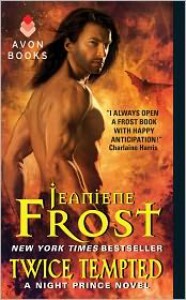 Night Prince series are one of the series of Jeaniene Frost, the same world with Night Huntress series and Night Huntress world series(spin-off). If you haven't read any Frost books, you might wanna start with the Night Huntress books. Some characters are recurring in the Night Prince series, so you should start from the first of her book series so that it won't confuse you. Smart, huh? Tho, it should be this way, her books got a lot of good and positive reviews. Twice Tempted for me, is as good as its book 1, Once Burned. The main character, Vlad, is edgy and strong, and animalistic. He's an alpha male on the top. A vampire with a lot of pride, a prince of his kind that stands above all. He's so proud. Proud enough to complicate a love romance. What more if his girl wants more than he give? What more if, an ex-lover ruin a shaky and tense relationship? What more if an old enemy threatened his girl? Conflicts made this book worth a read. But more than that, characters are as interesting as their love affairs. The very hot scenes of Vlad and Leila is different from the other romances out there because you'll see the love in them, not just the lust. Oh don't get me started with how Vlad tell his love with the few words but hits to the heart everytime. Tho, the three big words makes him sink everytime, you'll find yourself waiting for him to say them. A good read. A bad, sadistic, alpha male vampire who plays with fire (literally and on with the other.. things). A romance like no other. Slow tears continued to trickle down my cheeks, but for a different reason this time. The words were whispered with a despairing sort of wonder. He wasn’t willing to rescind his loveless vow, clearly, but I was wrong about the apathy I’d thought he felt. That he admitted all the above was surprising enough; the fact he’d done it within earshot of his pilots was no less than shocking.